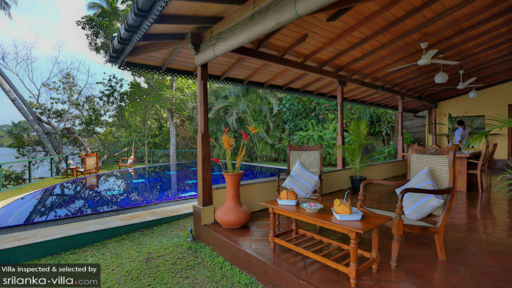 South Point Cottage is a wonderfully tropical holiday home located right by the beautiful Koggala Lake and just a 5 minute drive from the beach in the south of Sri Lanka. 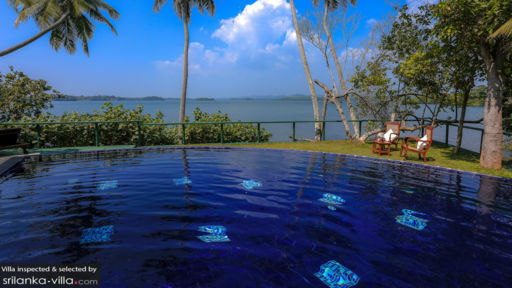 A dream come true for families or couples, seeking a secluded tropical holiday getaway to unwind and relax completely to the breathtaking views over Koggala lake. The garden is utterly tropical and peaceful, with direct access to the lake from a private wooden pier, which makes a great spot to enjoy an intimate early morning breakfast or watch sunset while sharing a chilled bottle of white wine. The garden also features a triangle-shaped swimming pool and an expansive manicured lawn shaded by towering palm trees, perfect for the kids to run around on and also ideal for an intimate garden party with delicious snacks and drinks. Sunbeds are places in such a way that you can enjoy the lake view while working on that beautiful tan. The South Point Cottage embraces the sweet tropical lifestyle with the veranda and the garden as the communal hub off of the villa where the living and dining is done. The pavilion is surrounded by lush tropical greenery and looking out onto the lake. There are lots of nice places to sit and take in the magical view while sipping from a nice cold drink. It also comes in handy that you can keep an eye on the kids playing in the swimming pool while reading a book at the seating area or enjoying a meal at the alfresco dining table. The master room takes up the entire first floor of South Point Cottage and the room is adjoined by two balconies where you can find some peace and quietness, reading a book or simply gaze at the lake view. The room is furnished with a large king-size four poster bed draped by a white mosquito net for a perfect night sleep. For your entertainment there is also a satellite TV with DVD-player and a music set up. The en-suite bathroom is spacious and while rinsing off beneath the hot/cold rain shower, you can still gaze at the view over the lake through a large window. The villa houses two more air-conditioned bedrooms located on ground level. The Lake View room features a large double bed and The Garden View room features twin beds along with a bunk-bed, making it the perfect bedroom for the kids. Both rooms feature a private en-suite bathrooms with hot/cold rain-showers for relaxation after a spending the day swimming in the lake or in the sea. The South Point Cottage has friendly staff looking after you, making your stay even more pleasurable. The housekeeping is done for you, a chef can be arranged and in the night there is security keeping your safe. The manager is always available on call to answer your questions and take care of any special requests. The staff can also arrange in-villa Ayurvedic massages or art classes upon request. 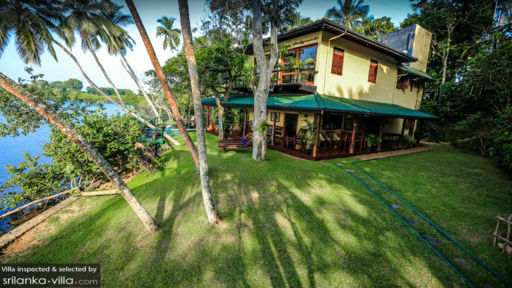 The South Point Cottage is located in a quiet rural village, surrounded by Cinnamon plantations and the lake where you can go fishing or canoeing. The beach is just a 10 minute stroll away and in the surrounding area there are also some nice restaurants to be found. To sniff up some culture, visit the Martin Wickramasinghe Museum where you get to see traditional dance costumes, clothing, instruments, weapons and vehicles. It takes 15 minutes to get to the domestic airport of Koggala and 3,5 hours to drive to the international airport of Sri Lanka in Colombo. Stay here. You just must! This is a very peaceful location, away from the tourist crowds of seafront locations. There is plenty of nature to see if you sit and read on the upstairs balcony - monkeys, birds, squirrels and even eagles! We stayed for 4 nights and were looked after beautifully by the staff. We ate delicious food, which was better than any other place we went in Galle, and never wanted for anything. The staff will put you in touch with local tuk tuk drivers who speak excellent english and will act as a tour guide if you wish. We hope to return here some day and make more wonderful memories. This is a peaceful, relaxing environment and the level of customer service is superb. The staff has an uncanny ability to anticipate your every need and then some. You have the opportunity to do as much or as little as you want. I would recommend this property to anyone who wants somewhere to unwind or get away from it all. My family spent a relaxing week at the cottage, using the pool, fishing on the lake and the odd visit around the area. Property and staff excellent. If you want a relaxing and peaceful holiday this is the place for you.